HMi Technologies provides class leading marine monitoring and control solutions using FT NavVision software. In addition to specializing in Marine Monitoring and Control, HMi Technologies offers a unique set of electrical and mechanical products and services to Commercial and Pleasure Craft systems installers, Custom and Production yacht manufacturers, Naval Architects, Brokers and Design Firms. 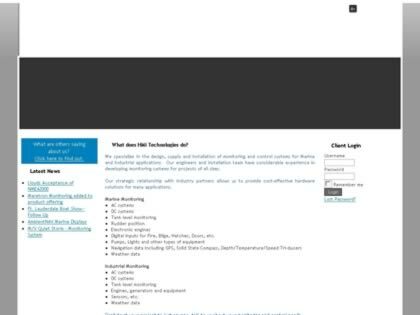 Web Site Snapshot: If available, above is a snapshot of the HMi Technologies Inc web site at http://www.hmitechnologies.com/ as it appeared when this site was added to the directory or last verified. Please Note that Boat Design Net has no involvement with the above web site; all content and images depicted in the above thumbnail are the property and copyright of HMi Technologies Inc unless otherwise noted on that site. Description: HMi Technologies provides class leading marine monitoring and control solutions using FT NavVision software. In addition to specializing in Marine Monitoring and Control, HMi Technologies offers a unique set of electrical and mechanical products and services to Commercial and Pleasure Craft systems installers, Custom and Production yacht manufacturers, Naval Architects, Brokers and Design Firms.